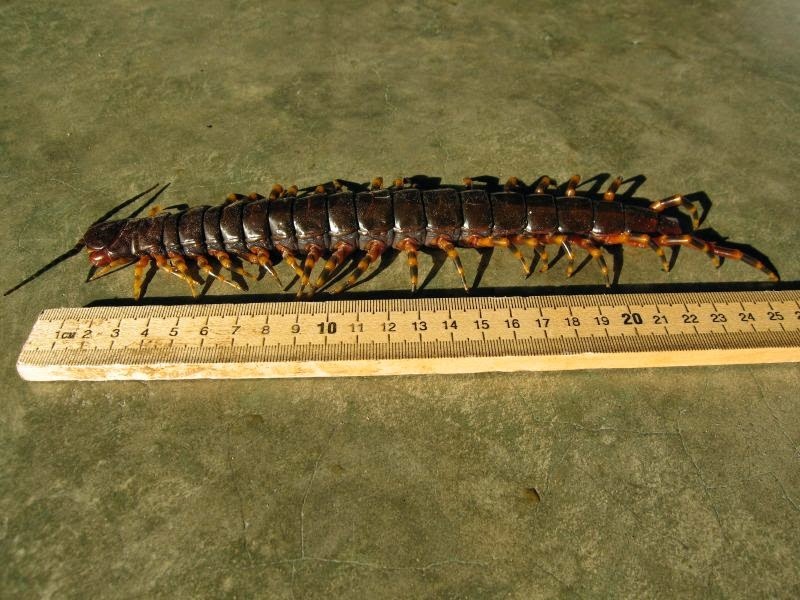 Meet the Amazonian Centipede, a large carnivorous centipede that is widely accredited as being the world's largest centipede, reaching a maximum length of about 35 cm (14 in)! 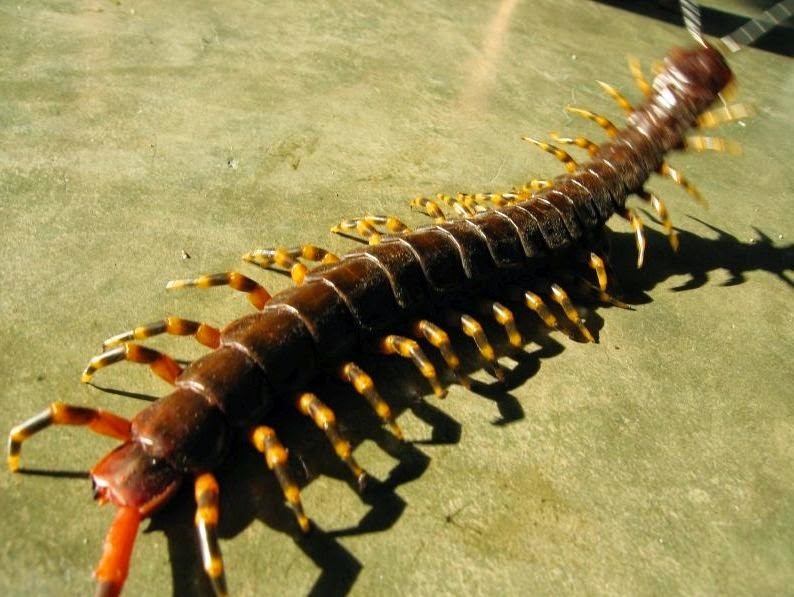 Also known as the Peruvian giant yellow-leg centipede or simply the giant centipede, it occurs in several areas of South America and the Carribean. As aforementioned, the amazonian centipede is one of the largest centipedes, routinely reaching lengths of 26 cm (10 in), and sometimes 30 cm (12 in) or more. Like other centipedes of the Scolopendra genus, the body S. gigantea has 21 to 23 well-marked sections, each section with a pair of legs. The legs are adapted for fast movement during hunting or retreating. The head is covered by a flat shield and features a pair of antennae, and a pair of modified legs terminating in sharp claws called forcipules, which are the centipede's primary weapon for killing prey and self-defense. The forcipules are used to penetrate the victims' body and to inject the highly toxic venom. The centipede comes with simple eyes with poor vision, seeing only shadows and light, so it relies highly on touch and its chemoreceptors. Both sexes look similar and are hard to distinguish. Since they have no waxy covering on their cuticle, they are limited to living in humid environments, and are usually be found in soil, leaf litter, or rotten wood. The species is carnivorous and surely not a picky eater as it feeds on everything that it can kill. This includes invertebrates like insects (e.g crickets, worms and snails) and even tarantulas, but also vertebrates like lizards, frogs (up to 9,5 cm long), snakes (up to 25 cm long), small birds, mice, and even bats. During the breeding season, the female releases pheromones for the purpose of attracting a male. The male then makes a silk pad and releases his sperm onto it. This is called a spermatophore. Next, the female picks up the spermatophore and lays the now fertilized eggs (usually fifteen to sixty) into little holes in the ground. She then covers the holes up with dirt, allowing the eggs time to mature. The female protects the eggs and cleans them from time to time to prevent infections from fungi. These critters are very aggressive and nervous. During a fight, the amazonian centipede will use its entire body to coil its prey (or enemy) with all its legs firmly attached to the body of the opponent. The venom of S. gigantea is very potent, containing acetylcholine, histamine and serotonin (pain mediators), proteases and a cardiodepressant factor. This mixture is fatal to most small animals. Although non-lethal to humans, it stills packs quite a punch and can cause severe pain, swelling, chills, fever, and general weakness. It may prove lethal to those who are allergic to the toxins. Sightings are very common and there is currently no indication that the species is in any way endangered. - R. M. Shelley & S. B. Kiser (2000). 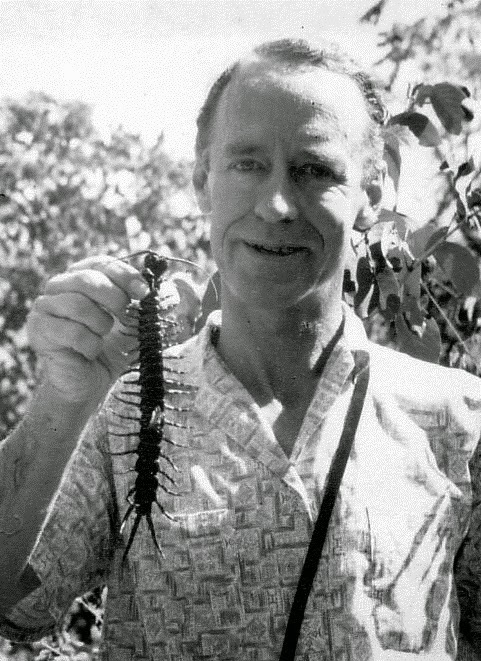 "Neotype designation and a diagnostic account for the centipede, Scolopendra gigantea L. 1758, with an account of S. galapagoensis Bollman 1889 (Chilopoda Scolopendromorpha Scolopendridae)". Tropical Zoology 13 (1): 159–170. - J. Molinari, E. E. Gutiérrez, A. A. de Ascenção, J. M. Nassar, A. Arends & R. J. Márquez (2005). "Predation by giant centipedes, Scolopendra gigantea, on three species of bats in a Venezuelan cave". Caribbean Journal of Science 41 (2): 340–346.